Cottontail rabbits are common throughout most parts of Indiana. Because of their food preferences, the presence of cottontails frequently conflicts with agricultural and forestry interests. They also can damage gardens, ornamental trees, shrubs, fruits, vegetables and lawns. Cottontail rabbits (Sylvilagus spp.) inhabit brush land and marginal areas and seldom venture far from brushy cover. They are commonly found along fence rows, in brushy fields, along the edges of cultivated fields and roadsides, and along creeks and streams. They also may live in poorly drained bottom lands and frequently in urban/suburban landscapes. These animals rest during the day in brush or other cover, or in underground burrows dug by other animals. Cottontails are not normally sociable animals and usually disperse over a given area. In urban/suburban habitats, cottontail populations may show a greater density than in rural habitats. Cottontails are most active at twilight and during the night, when they travel from cover to feed in open pastures, meadows, lawns, gardens and flower beds. Their diet varies with the seasons, but they prefer green vegetation. During the winter they will eat the bark and twigs from trees and shrubs if green vegetation cannot be found. Cottontails more often are a problem in gardens and flower beds where they feed on a wide variety of vegetables and flowers, and often cause extensive damage to ornamental plants. 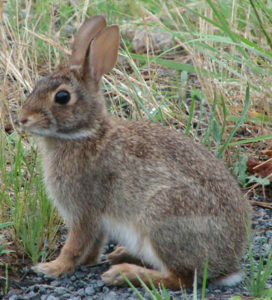 Cottontails also have been known to carry tularemia, a disease that can be transmitted to people. Reddish-brown to brown, cottony white tail. One to eight, average four. Four to five per year. Young are born year round, hairless, blind and helpless. Although it may be necessary to control cottontails to reduce the damage they cause, completely eliminating them is usually not necessary, desirable or even possible. There are several control methods that can be used. Modifying the habitat to make it less attractive to rabbits is often an effective method of control. The removal of brush piles, weedy patches, and rock or lumber piles will sometimes cause rabbits to leave in search of a more suitable habitat. This method is especially effective in suburban areas, where suitable habitat is difficult to find. Exclusion can be accomplished by constructing a rabbit-proof fence. A fence of woven wire or 2-inch poultry netting, 21/2 to 3 feet high, can be placed around gardens, flower beds or other places where protection is needed. Because of the cost of the fencing materials, this method usually is feasible only in small areas. To prevent burrowing beneath a fence, attach a 3-foot wide heavy gauge wire mesh screen to the bottom of the fence so it extends >24 inches outward. Secure the screen to the ground with garden staples and backfill over the mesh with rock mulch. Individual trees or shrubs can be protected by wrapping sheet metal or hardware cloth around the bases of the tree/shrub. The sheet metal or hardware cloth should encircle the trunk completely, and should be 1 to 2 inches away from the trunk to allow for the natural growth of the tree/shrub. Trapping can be an effective way to remove cottontails. Cage-type traps should be placed where the rabbits feed or travel. Apples, peanut butter, carrots, lettuce and cabbage are usually effective baits. Use these baits one at a time to allow the animal to choose it’s preferred bait. 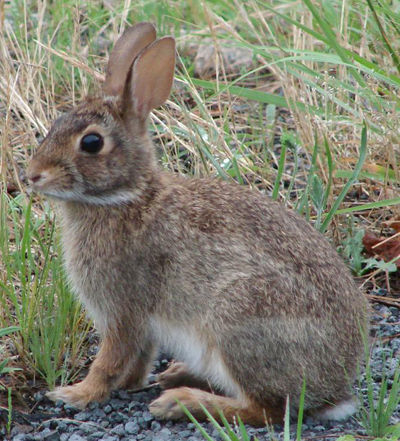 Several repellents are registered for rabbit control. Repellents are usually available from garden supply centers, feed stores and hardware stores. Repellents are most effective when used in combination with other control methods. Directions on all chemical labels should be read, understood and followed exactly. At present there are no toxicants or fumigants registered for use against rabbits in Indiana. Cottontail rabbits are classified as game animals in Indiana. Therefore, rabbits cannot be trapped or euthanized without a permit from the Indiana Department of Natural Resources, Division of Fish and Wildlife biologist. A person wishing to live trap and relocate rabbits should ask permission from the property owner where the rabbits would be released. Contact the Wildlife Conflict Information Hotline (877-463-6367) to obtain the phone numbers of your District Biologist or Conservation officers before using cage trapping or shooting as control methods. Cottontail rabbits can also be trapped and/or euthanized during the rabbit season; see the DNR’s website at www.in.gov/dnr/fishwild for information about season dates and regulations.